Corporate Counsel Women of Color is a 501 (c) (3) organization founded in 2004. 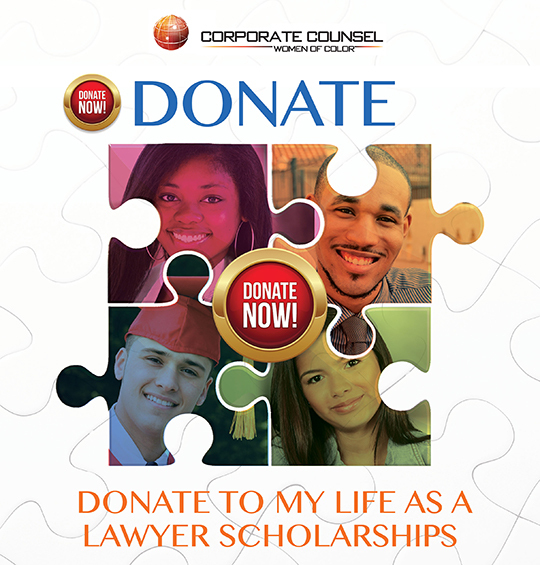 Each year, Corporate Counsel Women of Color awards scholarships to deserving law students from around the United States. Please make a monetary gift to our scholarship fund. 100% of your donation will be tax deductible and will go towards helping deserving students with their books, tuition, and other needs. Corporate Counsel Women of Color is committed to the privacy of our supporters. No personal contact information will be shared outside of the organization without an individual's written consent. 2017 © Copyright Corporate Counsel Women of Color. All rights Reserved.